Hey Toons! 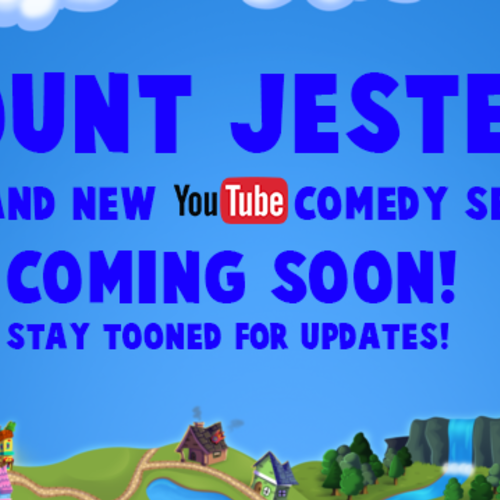 My name is Brandon Frangipani, and I am creating an online fan made comedy series based off of one of the most famous MMO's, Toontown! And it is called, Count Jester! It is based on the toon of the same name! Now, this series will be multiple episodes, and will be CGI animated (just like how some or most shows use the CGI format). This won't use the original Toontown Rewritten models and stuff. This series will use brand new models made in Autodesk Maya 2018, and the animation software to be used is still a decision to make (I am planning on animating in 3DS Max or another program; this is still to be decided). The final product of each episode is about between 3 to 6 minutes long, as it is a series of short comedy videos ranging from this variation of minutes. It will be uploaded on YouTube once each episode is completed. Now, for the actors turnaround time, they can take as much time as needed in order to fully complete their voice work. I'm not one of those people who are like, "Complete this fast enough!" or something like that; I want my actors to not feel stressed about anything and I am a very patient person; I don't mind waiting until it is fully done. The time frame I am looking at is Summer/Fall 2018 for the first episode, although this might change if production goes smoothly enough. Thanks! And remember, have fun and Stay Toony! P.S. More roles will be added soon once I come up with some character ideas! Count is a purple anthropomorphic cat from Toontown. He is sarcastic yet funny and is an adventurous guy who will go to great lengths to keep his comedy show up and running. He also loves making friends and meeting new people, although some people annoy him to no end. (Excited) Hello guys! Welcome to the best and most Tooniest comedy show on the internet! (Sarcastic/Funny/Partly Raging) I knew it! I KNEW IT! YOU WERE THE ONE WHO ATE MY CHOCODILES! I MEAN, WHAT THE FRICK ARE YOU USING, A LIGHTSABER JUST TO GET THOSE? (Sarcastic/Funny) Oh, cool, they gave me a medal. THEY GAVE ME A MEDAL FOR SUCKING AT FRICKIN' TOONTOWN! Stacy is a pink cat and the younger sister of Count. She is a calm and sweet cat who looks out for her brother, yet has a rivalry with one of her college classmates, Giselle, a pink dog who thinks she is better than Stacy. However, Stacy will keep making gadget and gadget until she can prove to her school that she is the best technology student in the history of Toontown. Count, can you please stop all that raging? I'm trying to watch TV! Well, ya win some, ya lose some. Except when you lose to your rival in college who thinks she is better than you. Then ya lose some. I. Don't. CARE. Stop raging or I am calling Dad! Giselle is a pink dog who is Stacy's rival in college, and has a long lasting enemy-like relationship with both Stacy and Count. Giselle always bests Stacy at her own game, but seems to think that Stacy might win the Toontown University Science Fair, so Giselle tries to screw it all up, even if it blows up in her face. (Sarcastic) Ha! You thought you could best the likes of me? My voice is cracking, I'm practically pubescent! (Mad) UGH! I HATE WHEN THIS HAPPENS! AND IT'S ALL THANKS TO THAT STUPID PINK CAT OF A STUDENT! (Comedy) See ya next time folks, and remember, bring some eggs to throw at Stacy... I mean, to throw at Count... I mean... aw, gosh diddly darn it I keep messing up my line! Who wrote this script?! Someone needs to get fired! 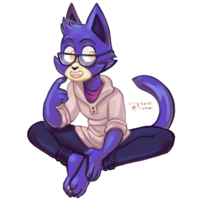 Count and Stacy's dad is a blue cat, who is away in Wackyville for a science department internship that lasts 2 years, and he is always supportive of his kids. However, he doesn't know when to quit with the punny jokes... see what I did there? Well, kids, I know I am not there right now, but you should look after each other while I am gone. This science rigamaroll in Wackyville is all the jazz! (Mad) Don't mess with the likes of me! You make fun of my kids, I will make sure to put you... IN THE FORBIDDEN TICKLE CHAIR OF MADNESS! (Sarcastic; over the phone) Oh ho ho, what did you think, Ralph, that phones grow on trees? NOW GET TO WORK! Johnny Cogsworth is a Level 3 Cold Caller and for some reason is a high ranking cog in the Sellbot Corporation. Although he has a love-hate relationship with his job, Johnny would rather live in Toontown selling good things rather than destroying toons, which gets on his coworkers' nerves. Ugh, just another day at the boring office. When is there gonna be something fun to do? I'M A MAJOR GOOFBALL! IT'S IN MY GEARS AND... um... what not. You know what? YOU KNOW WHAT?! SCREW THIS MAJOR CORPORATION! I'D RATHER BE SELLING JOKES THAN WORK WITH YOU CLOWNS!